The workshop will be held from Tuesday June 12 to Friday June 15, 2007. Exact time schedules will be available at a later time. Consider that the following days (June 16 and 17) will be a special holiday period for Pisa. It will therefore be a very good time for visiting Pisa and its surroundings, although you should be careful and book your accommodation well in advance. See below for information about "Giugno Pisano". The workshop will be held in Pisa, and will be hosted by the Department of Computer Sciences of the University of Pisa. 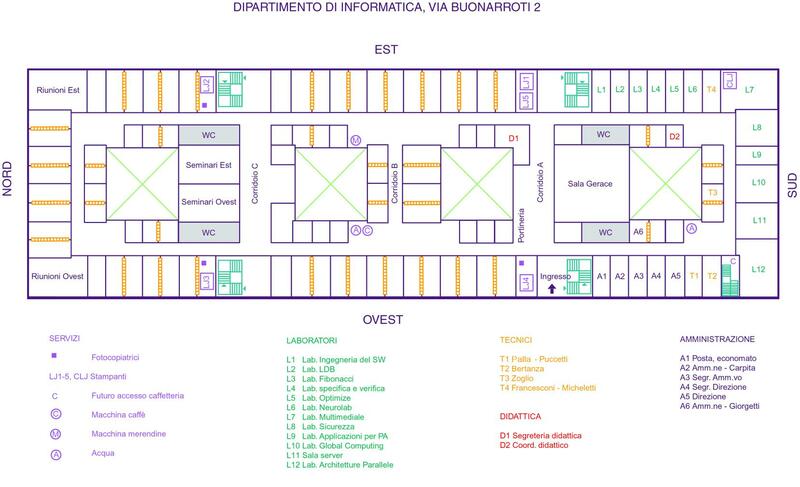 Riunioni Est and Riunioni Ovest, rooms for restricted meetings and as computer room. All spaces are covered by a WiFi network and participants will be provided of a guest account. Pisa Airport is also connected with many Italian airports, including Rome and Milan Malpensa. See the web site for a complete and up-to-date list of connections. The airport is very near to the center of Pisa and it is connected both by train (a 5 minute trip) and by bus to the Railway Central Station (Pisa Centrale). See below for further information and timetables from the Railways Station to the workshop's location. Pisa is only ca 3 hours from Rome by train. It also is easily reachable from Milan main train station (Milano Centrale) either through Genoa (less than 4 hours) or Florence (about 4 hours and 20 minutes). See the web site of the Italian Railways Company "Trenitalia" for the timetable of train connections. Please, refer to "Pisa Centrale" for the main Railway Station in Pisa and "Pisa Aeroporto" for the airport railway station. the map of the "LAM Verde" bus line. Pisa can easily be reached from the north by the highway A12 Genova - Sestri Levante - Livorno and by East and South through the highway A11 Firenze - Mare or the national road FI-PI-LI (Firenze - Pisa - Livorno). Here are directions for reaching the workshop's location by car either from North or from South and East. See the web site of the Compagnia Pisana Trasporti (Italian language only) for information about all bus lines. All deadlines are over now. When booking, please refer always to the fee agreed for participants in the NETTAB 2007 workshop. Every year on the night of the 16th of June the enchantment of the Illuminations of Saint Ranieri is renewed on the streets running along the river Arno (the so-called Lungarni). During the afternoon of June 17th, to celebrate the patron saint of Pisa, four boats representing the most ancient districts of the city (the city is divided into four sections ideally outlined by the river Arno and by the two main streets) compete in a Regatta along the Arno river, heritage of the past glory of Pisa as an ancient maritime republic. On the last Sunday in June, teams of the opposite parts of the town (Tramontana, i.e. northern part, and Mezzogiorno, i.e. southern part) divided by the Arno river engage themselves in a fight on the Ponte di Mezzo trying to push the adversary team on its side of the river by using a special trolley. Since 1956 the cities of Amalfi, Genoa, Venice and Pisa have participated in the Regatta of the Ancient Maritime Republics. The event, introduced for tourist reasons, evokes the past glory of the most important episodes of the story of the four Maritime Republics.